On your computer, open up iTunes and go to Account > Authorizations > Authorize This Computer. After that, simply click Authorize. This will authorize the computer so that it can officially download your purchases. A pop up window should come up, asking if you want to transfer the purchases from your iPhone to your computer. Just click Transfer Purchases if this happens. If you don’t see a pop up window, then you can go to File > Devices > Transfer Purchases from [Your Device Name], and this will do the same thing. You can only transfer purchased media. That’s right, if you downloaded music from a random website, or added music from other computers, you can’t transfer it to your computer with iTunes. It transfers all of your purchases (including music, movies, TV shows, and more), instead of just the specific ones you want. You can only transfer certain kinds of media. If you sync your files with iTunes, the files on your iOS device could possibly be overwritten and deleted during the sync. The above is of course the “official” way of transferring, as described by Apple. In spite of all of the limitations, this is what they tell you to do on their website. What they don’t tell you, however, is that there is actually a way to break past all of these limitations and have total control over your iPhone. You can transfer both purchased and non-purchased music. In other words, if you download a random MP3 from a website on your iPhone, you can transfer it to your computer—or even to other iOS devices. You can freely share files between devices, even ones with different Apple IDs. You can move music (and other) files to an external hard drive or transfer music from an external hard drive to your iPhone. Music is automatically converted when your transfer to your iPhone to make sure it playable on device. You can add files to your iTunes library or transfer from your library without even needing to open iTunes. As you can see, this is very powerful software. It allows you to say “no” to all of Apple’s restrictions and just do what you want with your own device. It's fully compatible with the latest iOS 12 and older versions. Step 1: Have iMyFone TunesMate on computer. 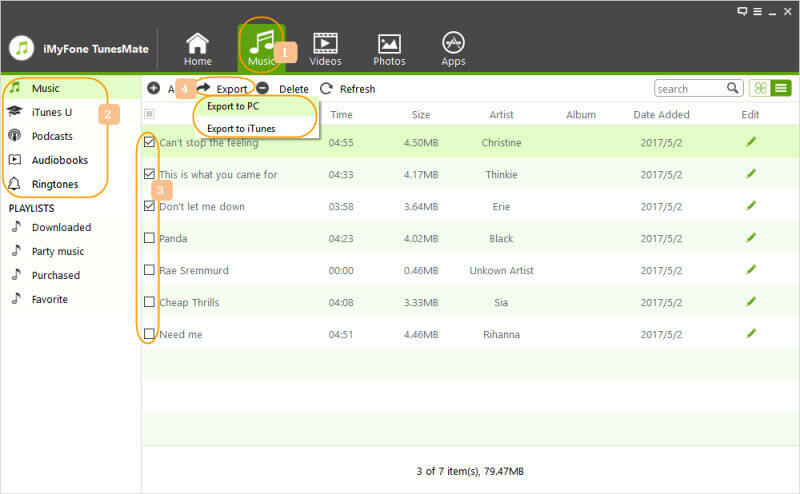 Plug your device into your computer, then launch the TunesMate application. Step 2: Click on the Music tab at the top, and you will see a screen with a list of the music on your iPhone. 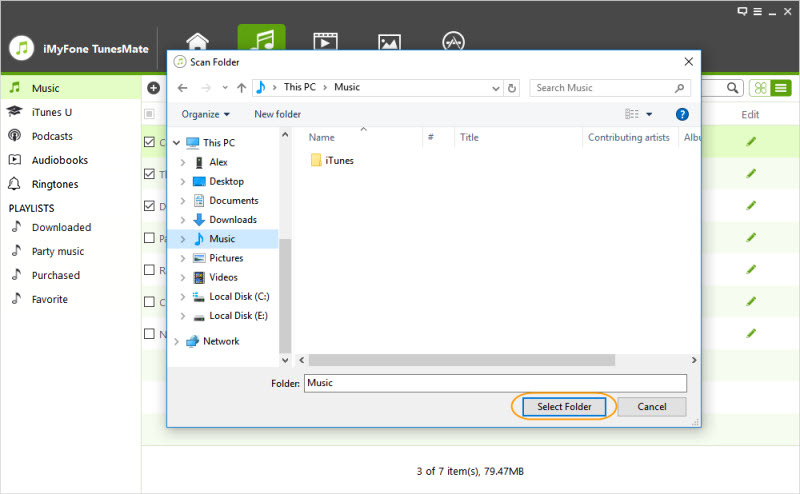 Select what music you want to transfer to your computer. Export to PC/Mac. After that, you can browse for a destination folder on your PC or Mac, and click Select Folder. From there, the application will automatically transfer your music. As you can see, it’s very easy to use iMyFone TunesMate, and it gives you a lot more control than iTunes does. If you want to transfer music quickly, even if you didn’t purchase it through the official store, this is a great tool to use.